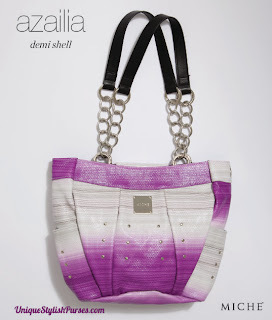 Azailia for Demi Miche Bags boasts a unique pop of color that looks amazing with your favorite crisp white blouse or casual white tee. Bright purple and white ombre printed canvas is sprinkled liberally with sun-catching mini stud accents. So slip into sandals and jeans, then get out there and shine! Side pockets. Streamlined design with oval bottom.